November 2016 – 2016 is a big year for CALPOL® – the iconic pink and purple brand is celebrating its 50th birthday! 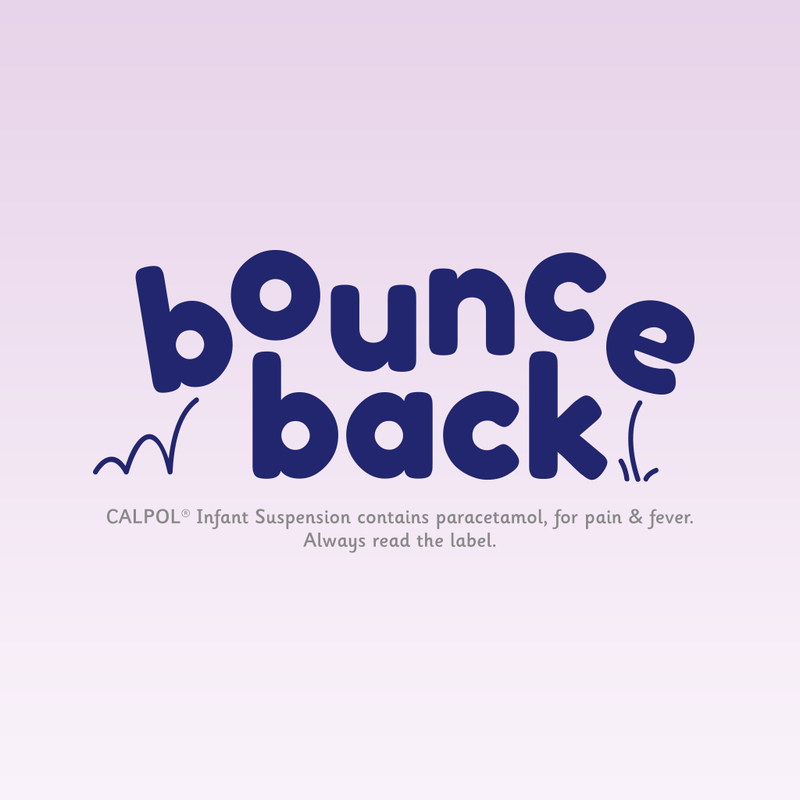 To mark half a century of helping kids to bounce back from who-knows-how-many aches, pains and fevers, CALPOL® commissioned a survey of 2,000 UK parents with kids 0-12yrs, and the results are in. Did you know that relief is by far the most common feeling that parents experience when they realise their little one is bouncing back from illness, with 68 per cent of parents in agreement? So what is it that UK parents treat their poorly children to when they’re feeling under the weather to help them bounce back to their usual selves? It seems like lots of cuddles is by far the most popular home-treatment, with 71 per cent of parents saying their kids like to be treated to a snuggle and a squeeze! So a little T.L.C. is commonly accepted as one of the best ways to deal with a poorly child, but it seems as though this is also something that has been passed down from the generations! When asked, ‘What did you learn from your own parents about how to look after your child when he or she is poorly?’ the runaway answer was also the importance of cuddles (59 per cent)! That said, it is the younger UK mums and dads that believe most firmly in the power of the cuddle, with 73 per cent of younger parents (those aged 18-24) saying that they inherited this secret from their parents. In conjunction with cuddles, toys help bring comfort too. Indeed, for generation ‘iGen’, tablet devices, computer games and games consoles are amongst the most popular toys to play with whilst recovering. 34 per cent of today’s children turn to tablet devices to cheer them up when they’re poorly – true digital natives! After their kids have been poorly, how do parents know when they’re starting to bounce back? It seems food, glorious food is the key, with 63 per cent of parents saying they know their kids are on the mend when they start to eat and enjoy food again. According to the research, what children want when they’re poorly is very different to when they’re back to health. Whilst poorly they wanted modern computer games, but when they’re well, it seems the oldies are the goodies! Colouring in and crafts (44 percent) and board games (39 per cent) are the top games that children play when bouncing back, compared to just 29.5 per cent who said that computer games are the telltale sign. So whether it’s running around in circles with underwear on their heads, or walking backwards making robot noises, you can always tell when they’re back to their normal (well, normal…ish!) selves. Send us photos or videos of you with your kids celebrating their bounce back moments (the quirkier, the better! ), for a chance to win weekly prizes from toucanBox, or grand prizes of Premium Family Merlin Annual Passes. You can submit as many bounce back moments as you like between now and the competition close date (17:00 GMT on 18th November 2016) to improve your chances of winning. We can’t wait to see your kids being kids, and celebrate all the strange and wonderful bounce back moments you’ll all get up to. Previous article The woman who fell pregnant when she was ALREADY expecting ! Next article Win a Sofia the First prize package from Jakks Pacific! The woman who fell pregnant when she was ALREADY expecting !